Since it’s the holidays again, it’s the time of year where I fulfill an annual tradition of re-reading the most important book to me: The Phantom Tollbooth. I am yet again reminded of the importance of imagination, learning, and attempting the impossible. But sometimes, I feel a little beyond the wonders of my beloved children’s novel. Sometimes life feels heavy and I don’t feel much like a naive kid full of expectations. Sometimes I need a novel for adults, one that balances the fine line between hopeful and sentimental by adding a dash of loss and sorrow. That’s why I want to talk about The Unlikely Pilgrimage of Harold Fry. I started reading a dark book after I recently lost a loved one. I realized fifteen pages into it that I couldn’t handle something so emotionally heavy. I needed something lighter, but not fluff. I absolutely hate sentimentality and rarely feel satisfied with a happy ending (on a side note, I’m a sucker for books that end with the main characters drowning, a la The Awakening and The Wapshot Chronicle, but maybe that’s just me). My very kind friend surprised me with The Unlikely Pilgrimage of Harold Fry, Rachel Joyce’s debut novel that had come highly recommended to him as being a happier but not schmaltzier book. The premise is rather endearing, but could scare more cynical readers away with its Lifetime movie packaged plot: married retiree Harold Fry receives a letter in the mail one day from an old friend who is dying of cancer. He believes that if he walks the 500 miles across England to her hospice, he will be able to save her. He leaves behind his bitter wife, still angry at him for something that had occurred in the past with regards to their son (the emotional core of the story that is slowly revealed as memories from the past unfold), and begins his walk with no supplies or concrete plans. Along the way, he meets many new and interesting people who offer him valuable insights on life, as well as gaining many followers who want to leave behind their troubled lives and follow him on their own pilgrimages. 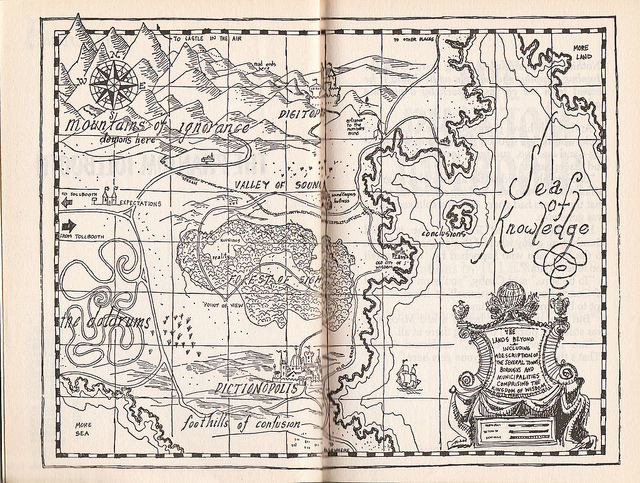 This map details the Kingdom of Wisdom in The Phantom Tollbooth. I nearly gave up on the book after three chapters because it just seemed too damn cute. Then a strange thing happened: I started to find correlations between this book and The Phantom Tollbooth. There was a scene early in the book where Harold is walking alone a stretch of country road and he starts to notice the world around him in a deeper way than he ever had before. This little scene of transformation reminded me of one of the fundamental lessons Milo learns in The Phantom Tollbooth: to look around and appreciate the world around you. From this small similarity, I realized that the overall plot of the two books aligned. In The Phantom Tollbooth, Milo takes on the impossible task of rescuing two princesses after traveling across the Kingdom of Wisdom. In The Unlikely Pilgrimage of Harold Fry, Harold’s self-imposed journey takes him across unknown lands to attempt to save a woman. Along both journeys, the protagonists meet many new characters who teach them life lessons big and small. Perhaps the moment that solidified my belief that these two books are related came when I noticed a hand drawn map at the start of The Unlikely Pilgrimage of Harold Fry that looked eerily similar to the one found at the start of The Phantom Tollbooth. 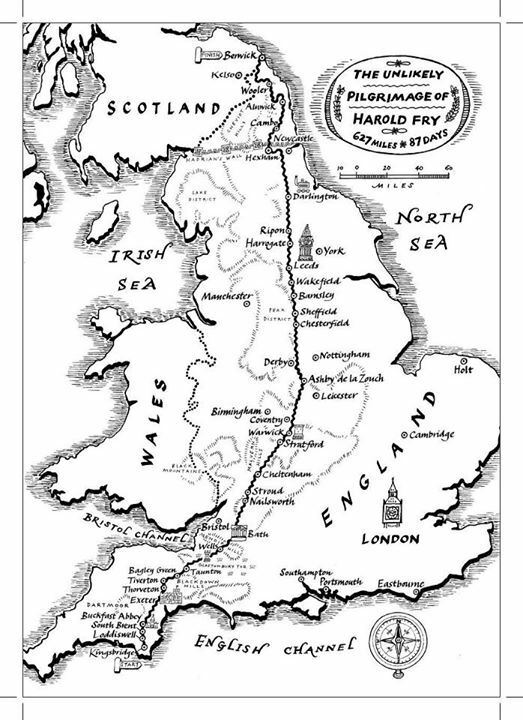 This map details Harold’s walking journey in The Unlikely Pilgrimage of Harold Fry. I have no idea if Rachel Joyce set out to pay homage to this children’s novel from the 1960s, but I’d like to believe she did. 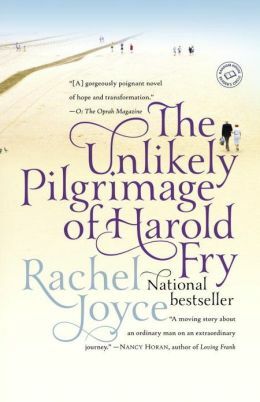 Because in the end, The Unlikely Pilgrimage of Harold Fry, is an amazing story about forgiveness and acceptance and a wonderful addition to the canon of books exploring broken families. But for me it’s more than that. It’s like a grown up companion to The Phantom Tollbooth. It reminds me that whether you are a child or a retiree, there is still a world out there worth exploring, something worth living for, and a personal journey we must all take to find it.